There are lots of ways you can use football banners and signs this football season! If your football team has any football camps during the off season, you should advertise with banners or signs so people know when the camp is and how much it costs. You can also let the football players know when and where the football tryouts are with a banner. football team. You can make individual football player banners that have their name, number, position and year in school. These banners can be hung in the school or displayed at the football game for all the fans to see. You can make a football schedule banner to let people know when are where the games are.You can put yard signs up around town letting people know that there is a game tonight. Cheerleaders can have banners saying things like "Go Team!" or "Touchdown" to use during the game. At the football stadium you can have banners up to let people know where the home team sits and where the visitor section is. You can also have signs up for the tickets, concession stands and tailgating locations. If you have any fundraising booths or merchandise booths you can have banners hanging up letting people know what is going on. If the football team has any sponsors, you should have banners thanking your sponsors. The banners can be displayed at the game on fences or by the end zones. 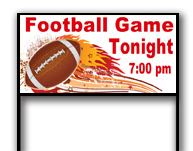 If you are ready to get started on your football banners and signs, you can go to our football banners page. We also have step by step instructions on how to make football banners in our online designer on our blog. So many important news about football from this blog which is related with football camp what helps to know football banners.Thanks a lot.